Bill Museler is tidying up his Herreshoff 12 ½, Raven, in the annex of the Annapolis Yacht Club when I walk up with my sister-in-law, Cindy Weber, who is bearing bottles of cold water. The race had only lasted maybe half an hour, but it was stifling hot, humid and shifty as always on a light-air summer evening in Annapolis harbor. The race had been hard-fought, if slowly. And with Cindy at the helm of her 12 ½, Hubcap, and me trimming, we had pretty much rocked it, recovering from a rough start to overtake the fleet (well, four other boats) and get the gun (well, horn). “No, we outlawed all protests,” says Museler. And, there are other deviations from the usual rules that bind faster, sportier boats. For instance, Museler notes that if the wind is just too shifty for a really good race, the first boat to the weather mark has the right to shorten the course, calling out the change to the other boats as he or she rounds the mark. The Annapolis fleet allows hiking sticks on the tillers, as well as battens in the jibs. They are tolerant enough to allow Hubcap, which is Bermuda-rigged, to race with the other traditionally gaff-rigged boats. And while the class rules dictate two persons per boat, it’s not unusual for the Annapolis boats to be loaded with grandkids, dogs, or all manner of other crew. In some respects, the egalitarian nature of the Annapolis fleet pays tribute in the finest way to the roots of this beautiful little boat, which was designed in 1914 by Captain Nathanael Herreshoff at the behest of one Robert W. Emmons II. Emmons wanted a quick but stout small boat for children to learn on while sailing the frequently choppy and windy Buzzards Bay in Massachusetts. At 15 feet length overall, with a commodious beam of 5 feet 10 inches, a full keel drawing only 2 feet 6 inches, a stout 1,500 pounds displacement and a healthy sail area of 140 square feet—the vast majority of it in the gaff-rigged mainsail—the new boat was stable, seakindly and pugnaciously graceful. 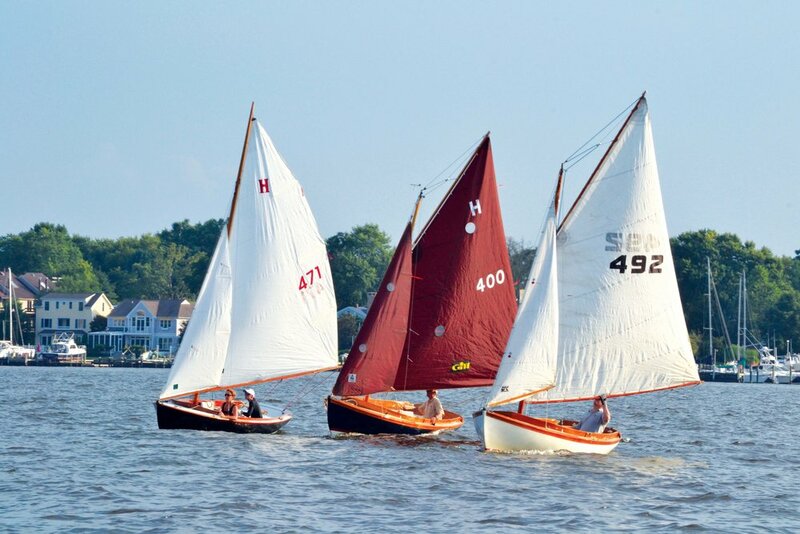 “Today the H Class can boast growing racing fleets of H12s from way up north in Maine, to farther south in Annapolis,” association President George Moffatt of the Beverly Yacht Club wrote in his 2016 letter to the class. In Annapolis, the fleet began in the 1980s when the late Arnie Gay, a marina owner and renowned yachtsman, brought hull No. 14 here and restored it, according to a 1996 article in Inside Annapolis magazine, quoted in the AYC newsletter. Gay convinced some fellow sailors to buy their own, and over time, the fleet has waxed and waned but has consistently drawn new owners. Many of them are older sailors who have raced in the past and want to take it a little easier; others are new to the boats and racing. Spencer Leech, who owns Blue Jacket, had sailed on one of the boats before in Edgartown, Mass., and in Annapolis with Mike Ashford, who was one of the early owners. He came by Blue Jacket in a unique and bittersweet fashion; her owner, the late Arthur Edwards, was Leech’s boss who asked him to sail the boat for him when he couldn’t anymore. “I never saw him sail the boat, but he would sit up at the yacht club and watch me sail,” Leech says. “When he died, he gave the boat to me.” Ordinarily Leech sails with his fiancée, and it’s the ease of the boat and the laid-back atmosphere that makes it so worthwhile. Cindy Weber, who grew up sailing on Weems Creek and the Severn River but was never big into racing, saw the H12s sailing in Spa Creek and on the river and thought it would be a great improvement on her Laser, which was cantankerous and physical most of the time, rather than a pleasant sailing platform. “I thought, that is the kind of boat I need. I could go by myself or I could take people,” she says. She bought her boat in 2004 and started sailing on her own and sometimes with her husband, John, on the river just for fun. Along the way, John urged her to get involved with the AYC fleet, and her friend and neighbor Maureen Walsh was all about crewing. Their biggest booster, John, frequently watches the races and enjoys kitting the ladies up in Hubcap swag, including team hats and shirts. they will race in the same conditions as the big boats, and sail just as hard. They’ll just be doing it with a lot more style. Wendy Mitman Clarke has been a chief chronicler of the people and places on the Bay for CBM. She is the Director of Media Relations for Washington College.